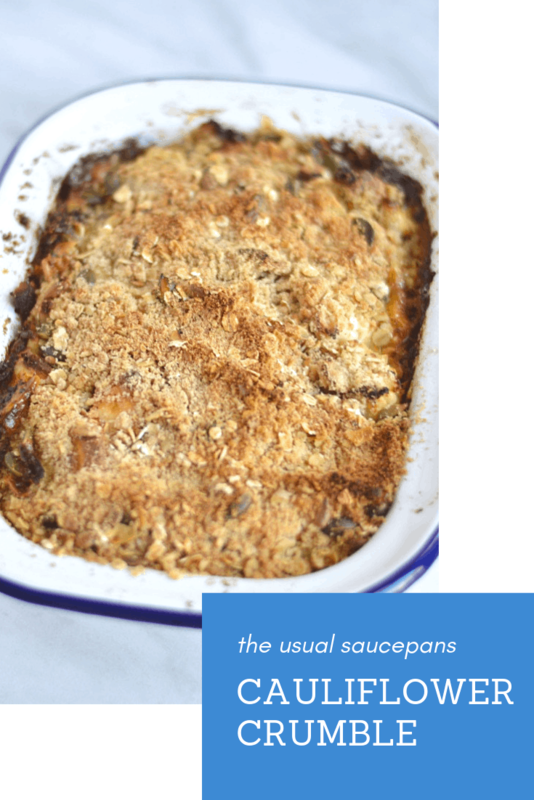 Is there a dish that more warms the senses than a crumble? 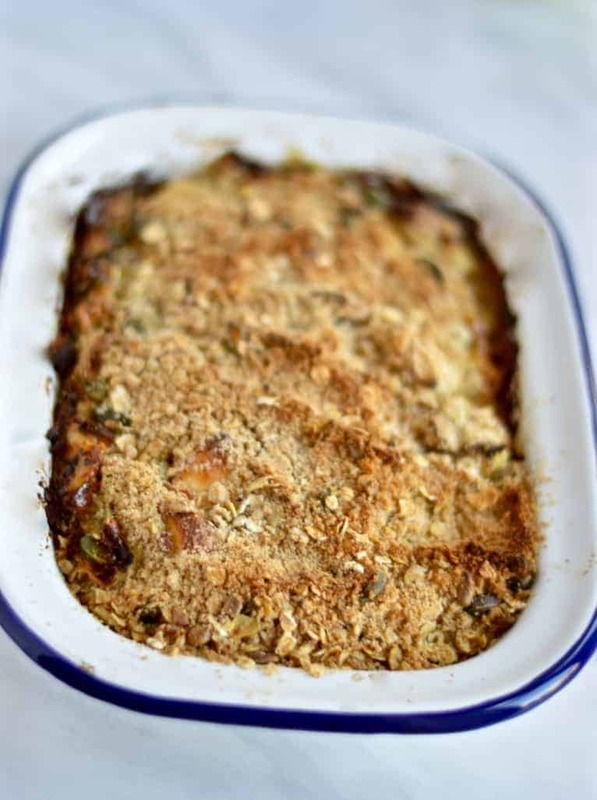 It speaks of crisp autumn and winter days, Sunday lunches and the simple pleasures of digging deep into a crumble dish. Often apples, rhubarb, pears and more, today we’re taking the savoury crumble route with a cauliflower crumble that’s full of goats cheese, broccoli and, of course, cauliflower. Here in the UK we’re very much down for crumble. It’s a dessert of choice for chilly days, but it’s much more versatile that. Savoury crumbles are an excellent plan for days you need comfort food. 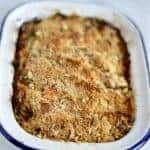 That crumble topping is crying out to have a hard cheese grated into it, the filling can be a gorgeous vegetable stew as much sticky baked fruit. We saw it a little while back with my tomato crumble, and there’s a lot to be said for this cauliflower crumble too. If you want to be proper, it should probably be called a goats cheese, broccoli and cauliflower crumble. But cauliflower crumble is much more catchy, so let’s stick with that. Is anything with this much cream in it ever anything but gorgeous? Don’t be fooled by the vegetables and think this is the healthiest dish on the planet – it’s really not. But if you’re looking for something warm, delicious, comforting and that’s a hug of a weekend lunch, this is for you. 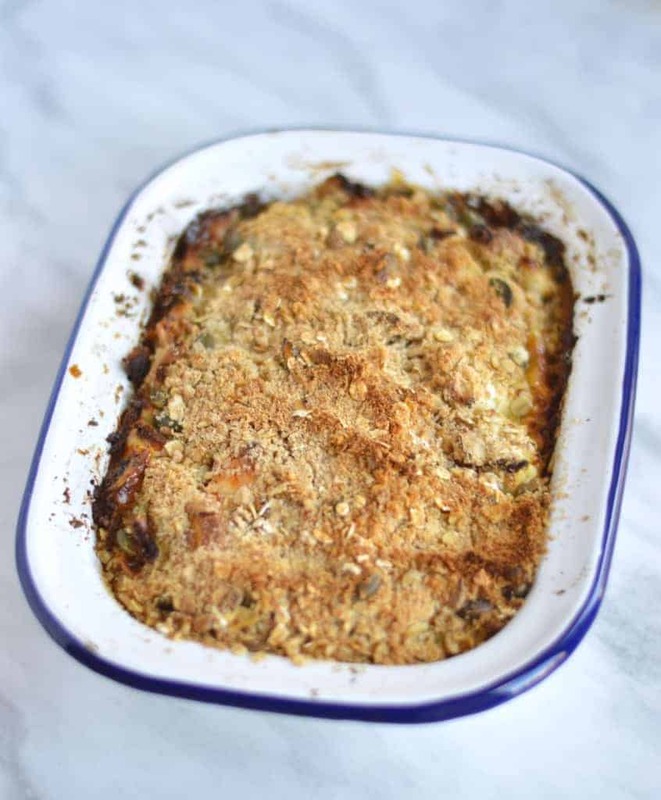 This savoury crumble is a brilliant autumn dish. It’s full of delicious fresh vegetables and there’s a good amount of goats cheese and cream in there for good measure. This recipe serves 2, but is easy to scale if you need to feed more. Preheat your over to 200 ‘C. Cut your cauliflower and broccoli into florets. 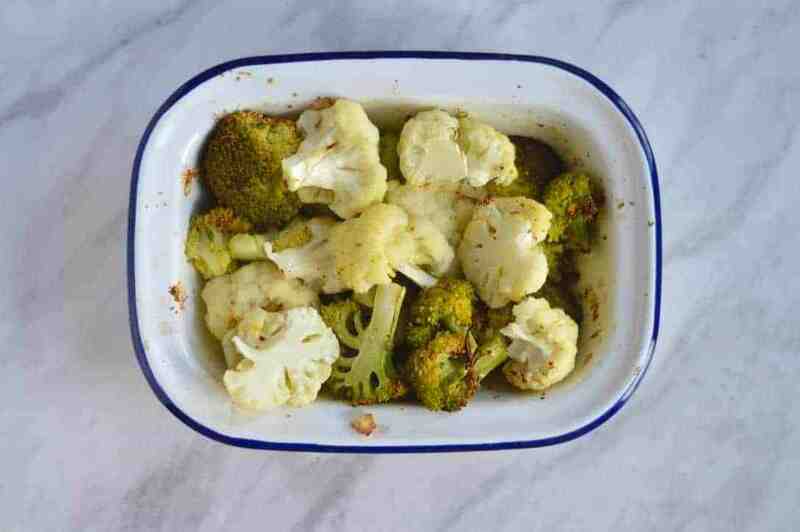 Put the florets of cauliflower and broccoli into a bowl and cover in boiling water from the kettle. Let them sit for a couple of minutes and then drain thoroughly. Tip well-drained florets into the roasting dish you are going to make the crumble in. Drizzle with the olive oil, crush and then add in the garlic, and top with a few good pinches of salt and some black pepper. Put in the middle of the oven, uncovered, and roast for 10 minutes. In a separate bowl, add in the breadcrumbs, oats, parmesan and a bit more salt and pepper. Cube your butter and add it into the mix. Get in there with your hands and work the mixture through your fingers until everything is mixed together. Take the florets out of the oven. Pour the cream over the top and mix it through. Crumble your goats cheese across the top of the mixture and then add in the crumble topping like a blanket over the whole filling. Return to the oven and bake for another 25 to 30 minutes, the topping should be golden and crisp.